Before the Internet of Things and the need to make every single item in your home a smart device, wireless home automation was commonly done with simple radio signals in the 433MHz band. Nothing connected to the internet, and the radio signals were sufficient for applications like wirelessly flipping a switch. These days WiFi-connected IoT devices are more popular, but 433MHz radio is still good enough for some jobs and Redditor 4_string_bass made a Raspberry Pi HAT to send those signals. The idea behind 433MHz radio control is very simple: each device to be controlled has dip switches that can be set to create a unique code that it will respond to. All the control device needs to do is send a radio signal with that code, and the remote device will turn on or off. It’s completely unsecure by modern standards, but that’s not a big deal if you’re not controlling anything that’s actually important. The benefit of using 433MHz radio is that it’s very cheap, and it works without internet or even a local network. To create their HAT, 4_string_bass placed a very cheap 433MHz transmitter and receiver on a piece of perf board. The other side has pins that match the Raspberry Pi’s GPIO header. The Raspberry Pi runs a custom Node.js web server that can be pulled up on a smart phone or computer to control the transmitter. All 4_string_bass has to do is enter in the specific control codes for whatever devices he wants it to work with (which are commercially available), and the Raspberry Pi will send them off through the custom HAT. 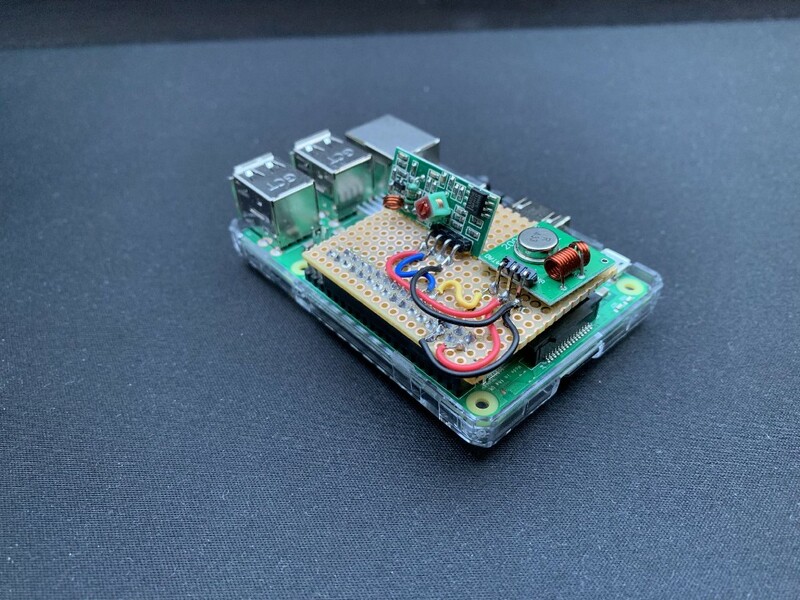 This 433MHz Raspberry Pi HAT Makes It Easy to Control Wireless Outlets was originally published in Hackster Blog on Medium, where people are continuing the conversation by highlighting and responding to this story.